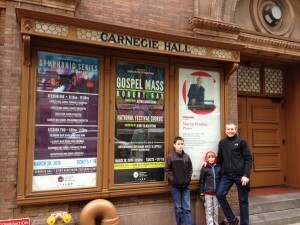 Home Blog How Do You Get To Carnegie Hall? Maybe you’ve heard the joke. As a punchline, this is unexpectedly cute. But as a musician, it also strikes me as a bit smug. If I want to get to Carnegie Hall, I need more guidance. How much should I practice? What should I practice? If Malcolm Gladwell is to be believed, it takes 10,000 hours of practice to reach mastery of an instrument. (Gladwell, Malcolm. Outliers: The Story of Success, 2011.) That’s a lot of time to spend in the practice room, but there’s very little information available about what to do once we are looking at the music. When I was a teen, every Thursday afternoon my flute teacher said, “Practice this page and have it ready for your lesson next week.” I would take the method book home and play through the exercises a few times. I always played from the beginning to the end at a fast tempo. I don’t remember ever picking up a pencil to mark a mistake and the thought never crossed my mind to isolate the hard parts and work on them. I practiced wrong notes. I made progress, despite my poor practice habits, but I wasted a lot of time also. I didn’t know what else to do. Recently, I needed to know how to get to Carnegie Hall. So, for spring break, my husband and I decided to take the kids for a vacation in New York City. I know Carnegie Hall is located at 1633 Broadway, NYC. But that doesn’t give me any usable information. It doesn’t tell me how to get there. Several months before the trip, I started planning. I bought a guide book for the city. We made lists of the things we wanted to see, concerts we wanted to attend, restaurants we wanted to check out, etc. We studied maps. About a month before our trip, I finalized our dates and booked a hotel. Then we packed our bags and loaded up the car. On the road, we had to find places to eat and gas stations for fuel. We stopped at a hotel in Pennsylvania the first night. There were tolls to pay and we got lost somewhere in New Jersey. When the kids got restless, we played games or listened to music. Driving in the city required nerves of steel (my husband’s) and deep breathing (mine). After parking the car, we set off on foot and gawked at all the tall buildings. Finally, we rounded a corner and arrived at Carnegie Hall. We had reached our destination. I took a quick picture of Bryan and the children. Son wouldn’t smile because his lips were chapped. Hungry stomachs urged us on to find a place for lunch. Our journey to Carnegie Hall took lots of planning and traversing 543 miles. Thinking back on the trip, arriving at Carnegie Hall wasn’t the highlight of our vacation. It’s pretty neat, but what I remember best is the lunch with a friend we hadn’t seen in years, the crisp spring air, and watching my children climb on the rocks in Central Park. This blog is for parents of young musicians who need support. It is for music teachers looking for new ideas. And it is for music students of all ages seeking inspiration. May this blog serve as a guidebook to your practice. I hope you will learn about how you can make your practice efficient. Perhaps you will find some of the hacks and games make practicing more enjoyable. Maybe you’ll be inspired by the scientific research on the cognitive and social benefits of music. But most of all I hope you are reminded that the journey is more important than the destination.